A report from the Pew Research Center shows that a college degree is more valuable today than it has ever been. In fact, people aged 25 to 32 with a college degree make 63% more than those without a degree. With this financial upside, it’s easy to see why high school students would view college as an investment and may be willing to take on some debt to fund their university degree. In 2015, 68% of the 1.9 million students who graduated made this investment by taking on some form of student debt. Like any investment, some factors can increase your return – academic rankings, SAT scores, and average potential earnings can help you determine the schools that will give you the best chance at financial freedom after you graduate. Put simply, knowing the facts about student debt will help you get the most out of the investment you make in your education. That’s why we looked at the relationship between average student debt at graduation and earning potential 10 years after enrollment for over 4,600 public and private (both for-profit and nonprofit) universities, colleges, and technical schools. Here’s what we discovered. When making an investment – especially one that impacts your financial future – you’ll want to attempt to minimize financial risk while maximizing potential reward. The highest valued schools in our study were mostly nonprofit private institutions. Graduates from these schools left with lower average student debt and higher average earning potential in the 10 years after enrollment. For-profit private schools appeared to be clustered around the $20,000 average potential earning mark with varying amounts of average student debt – these schools typically had higher student debt and a lower reward. This is not to say you are ever guaranteed success or failure based on a school selection. But considering these important financial factors could be the difference between having the freedom to buy a car, financially supporting a family, or taking some time to travel. An interesting discovery we found when analyzing the data was the grouping of schools around the $27,000 student debt level, a trend that seems to correlate with the total federal student loan borrowing limits for dependent students. 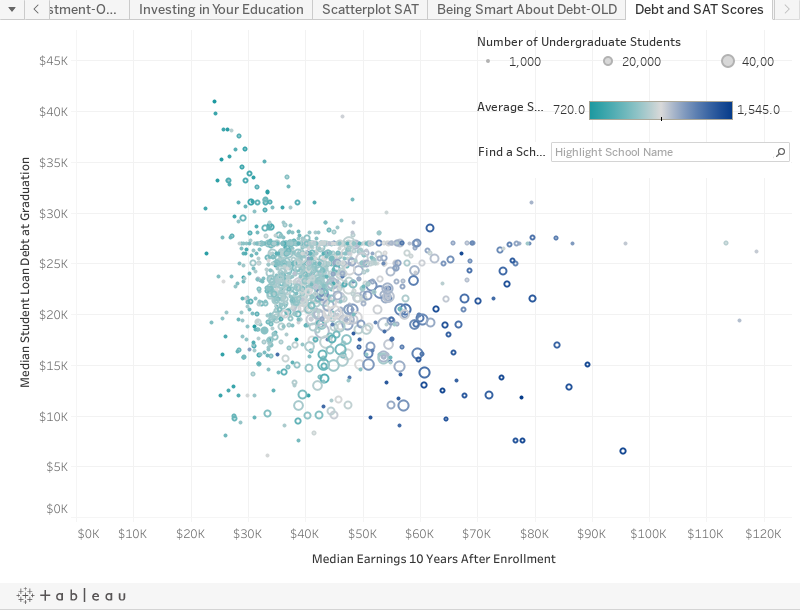 The data show a correlation between higher SAT scores and lower average student debt. 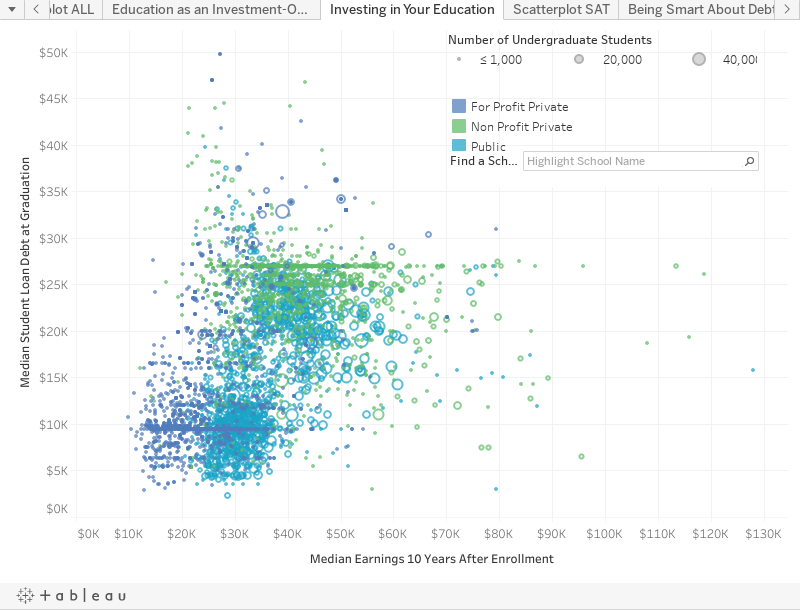 What’s more, higher test scores correlate with higher average earning potential in the years following graduation. For anyone still considering postsecondary education, we recommend taking that extra practice test or attending after-school SAT prep classes. Earning a higher SAT score will, at the very least, offer you further options to select a school that fits your personal and financial requirements. If low student debt and high average earning potential sound appealing, pay close attention to the names listed here. 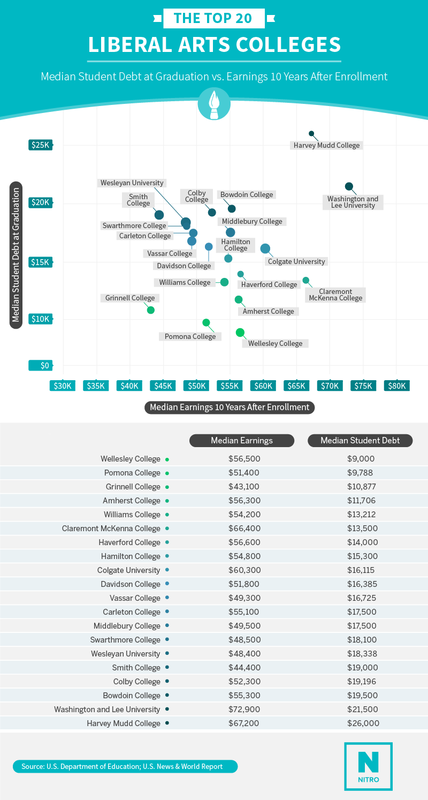 According to the data, any parents, teachers, coaches, or mentors who pushed us to attend prestigious Ivy League schools were right on the money, at least when it comes to debt and earning potential. Harvard may be top of the class for low average student debt and high earning potential, but all listed schools are among the best in the world if you are looking for a well-paying job after graduation. Not only will these schools give you a leg up in getting closer to your dream job (and dream salary), graduates tend to leave these schools with the lowest average student debts in the nation. According to our findings, students at Washington and Lee University have an average debt amount of $21,500 and average potential earnings of nearly $73,000. However, other schools on the list are not far behind with a similar average debt amount, and between $40,000 and $60,000 in annual earning potential. Liberal arts colleges may not typically come with brand-name recognition like larger schools, nor do they come with the same competitive average earning potential after graduation. They do, though, typically provide small class sizes, increased access to professors, and a potentially more personalized and well-rounded education. These benefits – in addition to developing a strategy for paying off your loans – can help prepare you for a fulfilling and financially stable future. Public universities are often attractive for their large and diverse student bodies, active athletics programs, an extensive catalog of class offerings, and a myriad of campus resources and activities. The Georgia Institute of Technology is a strong overall financial choice in this category, with an average student debt of $24,250 and an average earning potential of $74,500. However, the University of Virginia and University of Michigan clock in with average reported potential earnings in the vicinity of $60,000 and reported student debt of approximately $20,000. Based on the data collected, students who attend the schools listed above have the highest median debt when they graduate. 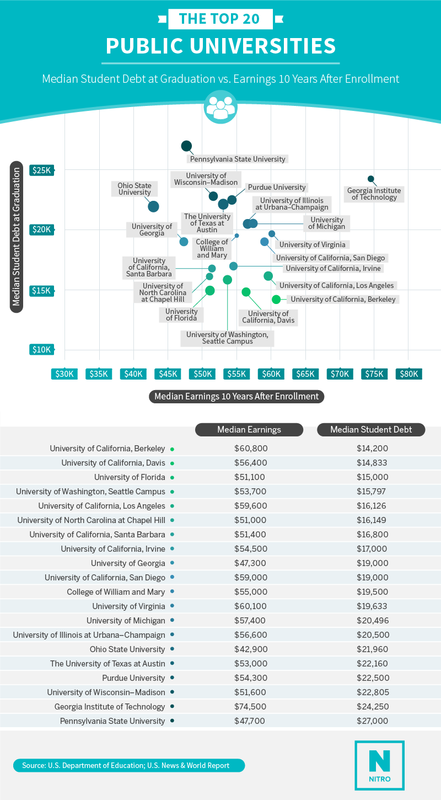 This does not necessarily mean that you will accumulate this amount of debt if you attend these schools, but it is a data point and should lead you to ask questions when considering the schools on this list. 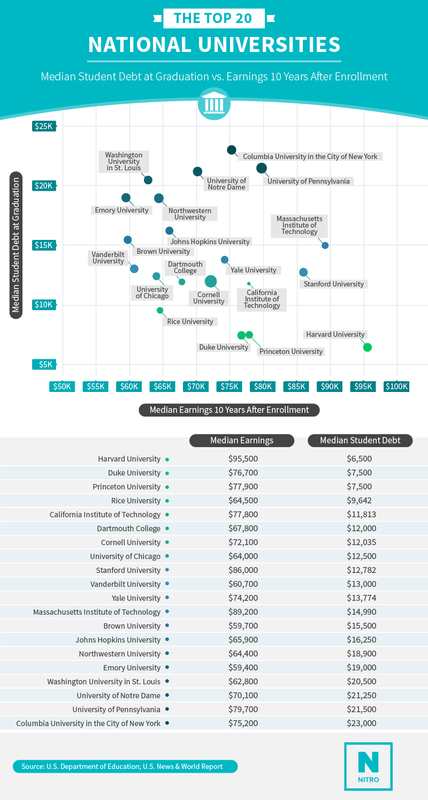 Graduates of the schools listed above have the highest median earnings 10 years after enrollment. Investigating the schools on the list, you can see that most of them are graduate programs that specialize in medicine, business or the law. The payoff of a high salary may be worth it for some, but it’s important to understand the other side of the equation before making these types of decisions. The average student who graduated from a medical school accumulated nearly $180,000 of debt. It’s important to remember that these are averages and may not be your particular situation, but worth exploring and asking question before making a decision about your future. 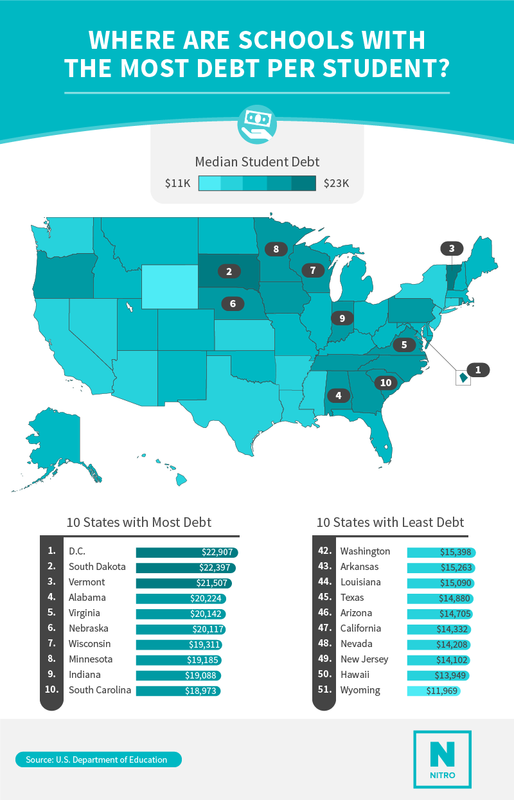 We wanted to see how schools in each state stacked up regarding student debt, so we ranked each one by the average debt in which students graduated. Schools in D.C. showed the highest reported rates of average student debt, while Wyoming schools had the lowest average student debt. This may have something to do with D.C. having a high proportion of private universities and Wyoming’s biggest schools being public universities. But if you have your sights set on a school in one of the states ranked high on this list, don’t be discouraged. Thorough research and proper planning make a significant difference in how much debt you accumulate and how effective you can be at paying it off. Where do people get the most value for their college degree? We looked at schools in each state to find the highest average potential earnings for graduates. 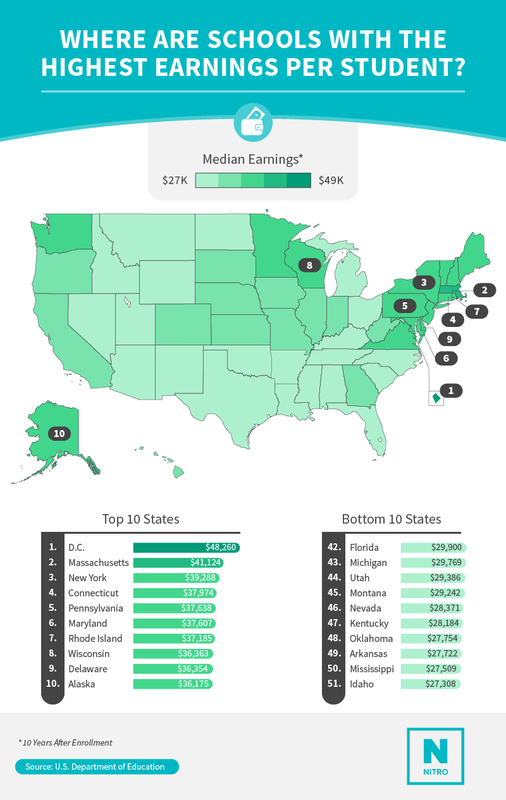 D.C. and Massachusetts had the highest average earning potential, while Idaho and Mississippi were on the other end of the aisle. However, remember the District of Columbia also had the highest average student debt amount. All this means is that it’s important to evaluate a decision across multiple factors. One way to choose a college or university is to consider value. We looked at the ratio of student debt and average postgrad earnings to show where students can get the most value for their dollar. Wyoming topped the list for offering the best value regarding average graduate debt and earning potential. But if you’d prefer a more tropical experience, Hawaii wasn’t too far behind for overall value. 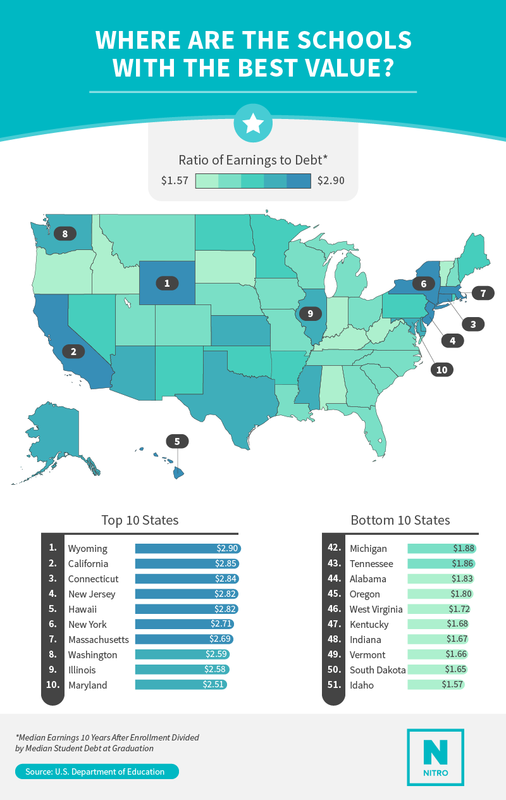 Idaho and South Dakota were seated last because the average debt and potential earnings for each state represented a relatively small financial return on investment. College has been proven to be a worthy investment and one that can set graduates up for a stronger financial future. When thinking about funding your education, it’s recommended to first explore all of your free options (savings, scholarships, grants, etc.). After that, look into the federal loans provided on your financial aid award letter from your college. If there’s still a gap, private student loans may be your next best option. We analyzed data from the U.S. Department of Education’s College Scorecard, available at collegescorecard.ed.gov. The dataset used can be found at https://ed-public-download.apps.cloud.gov/downloads/Most-Recent-Cohorts-Scorecard-Elements.csv (the version updated on Jan. 13, 2017). For the “Top 50 Schools” analysis, schools with multiple campuses were combined if there was no reported difference between debt amount or earnings at each campus, and schools were not included if they were not accepting new students as of 2015. This report and the associated images may be shared with readers for noncommercial purposes only. If you choose to use this material on your own website, please give proper credit to the researchers and authors of this study by linking back to this page.